Click here for the information shared at the June 5, 2018 public meeting. 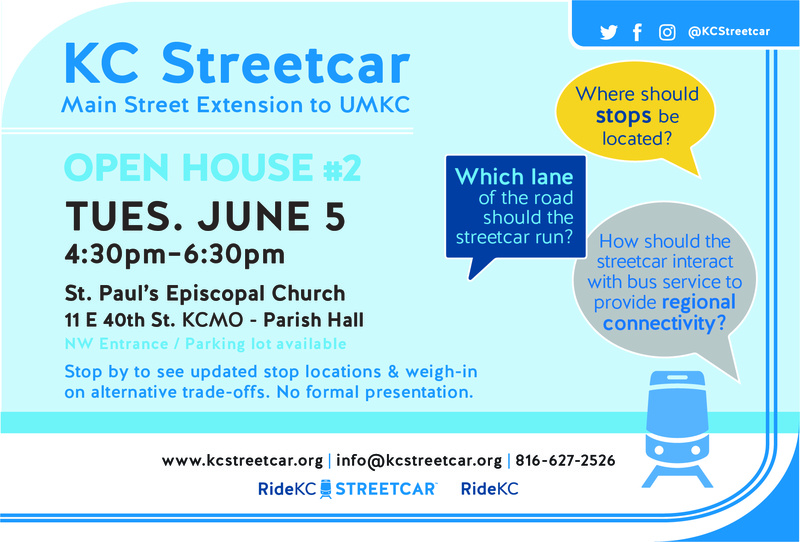 The second public meeting for the KC Streetcar Main Street Extension is set for Tuesday, June 5, from 4:30 p.m. – 6:30 p.m. in the Parish Hall of St. Paul’s Episcopal Church, 11 E. 40th Street, Kansas City, MO. Together with the KC Area Transportation Authority and the City of Kansas City, Missouri, the KC Streetcar Authority is asking for community input regarding two track alignments at this open house style meeting. One option is based on having the track in the outside lanes of the street, similar to what is currently downtown. The second option is based on a center-running track, where the track runs in the middle, inside lanes of the street. The open house is an opportunity for the public to look at these concepts on maps, learn about the trade-offs, and provide feedback. In addition to the public meeting, there will be a public comment period for the community to provide additional feedback on the KC Streetcar website, www.kcstreetcar.org. Following the public meeting and open public comment period, the project team will analyze the feedback and develop a preferred concept. That preferred concept will move into a more detailed phase of design.